I've been going back and forth with the guy. It's a form AB. David Kilnapp wrote: I've been going back and forth with the guy. It's a form AB. Actually this fan is an 1899 Form F stick mount and it looks to be in great original condition. The photos block out seeing if the cover to the grease cup is there and there is no visible speed coil so I am wondering if this could be the uncommon single speed 6 pole motor made in 1899. There is another beautiful and "crisp" (the details)1902 stick mount pancake listed which would be Form AB. It has the oil cup incorrectly mounted on the top of the bearing which is not a problem; just needs to be switched with the screw under the bearing. Both are nice fans and good pancakes are not getting cheaper. Compare the finger/hand marks in the dust on the wing and the badge orientation from the auction photo and the ebay photo. While both of these are nice fans, the 1899 is undervalued if, in fact, it is a six pole F5. Even as a F4, it's a good deal. The 1902 sticks are pretty common, since that year of manufacture was the most prolific....JMO. What's interesting is there is no numeric designation behind the Form F on the 1899 pancake as far as I can tell in the photos. Also notice the strut screws are slotted in the auction photo Russ posted and the ebay listing. Incorrect. They are the same fan. What does "SPEC. 3710" signify? James Henderson wrote: What's interesting is there is no numeric designation behind the Form F on the 1899 pancake as far as I can tell in the photos. I have a pair of 1899 sticks, both two speeds and one is Form F and the other Form F4. Maybe the number was not always that important to stamp on the motor. I wish I could afford it, but I've bought a couple thousand dollar fans recently, and am buying another tomorrow...My birthday is in three weeks, somebody hook a brotha up please! The spec number would signify what the fan is....Spec numbers weren't used much in 1899, with only a couple of fans in the survey having them. There is a 3706 which is a UI form F4 in 104v 60 cycles CGE. Another is 3725, which is a UI form F4 115v 60 cycles. Spec numbers were used mostly on 1900 and 1901, with some carry over into 1902. The numbers would tell what the frame, size, voltage, and cycles were to a specific model. Besides Steve's fan being form F, there is a K, and an E. Besides those three, the other 47 entries in the survey are either F4, F5,E7,G2, or A. I have inquired of the Ebay seller to check and see if the motor is a six pole or a four. The form letter F and F9 are what is primarily seen in 1900, indicating the fan is a stickmount. A 1900 type UI form F9 in 104v/60c would be spec 12721. I heard back from the seller. They replied they didn't understand what I was asking. I sent a picture but haven't heard back. In my opinion, I wouldn't go after this fan if you are thinking it's the rarer F5 six pole. As a four pole F4 model with a missing choke coil, it's a nice fan to have but is over priced as such. FWIW...…. Where are you foks getting all this information?? Since the motor tag simply has a F designation without any number we can't be sure if it's a 4 pole or 6 pole motor without hearing from the seller. Right? Someone has to physically count the poles. The F designation sure doesn't help make a determination. A number after the F in 1899 is the norm. The missing choke coil might make you think F5 but without a visual of the stator, it's 50-50. Don't get me wrong, the four pole F4 is a really nice fan and is the dividing line between really expensive fans before and the more common fans after. It's just that the F5 six pole motor is a lot rarer and worth more than the F4. I've had a few interested buyers contact me wanting to know my opinion or if I had heard back from the seller. That's the only reason I got involved.....If I hear back from the seller, I'll let you know. Auction ended last Sunday. 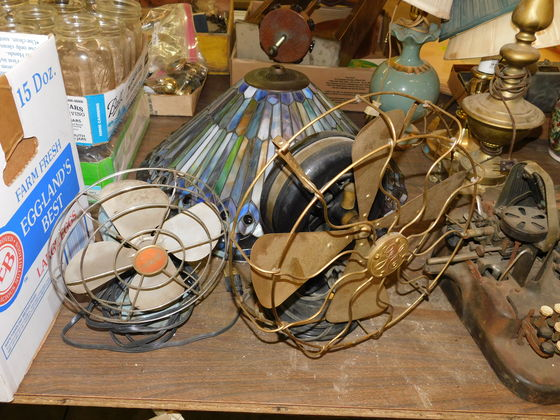 Fan sold for $1500 + or -. Page processed in 0.2379 seconds (31% database + 69% PHP). 29 queries executed.